Luxman C-700u/ M-700u review | What Hi-Fi? Founded back in 1925 when radio broadcasting first started in Japan, Luxman is one of the oldest hi-fi brands around. 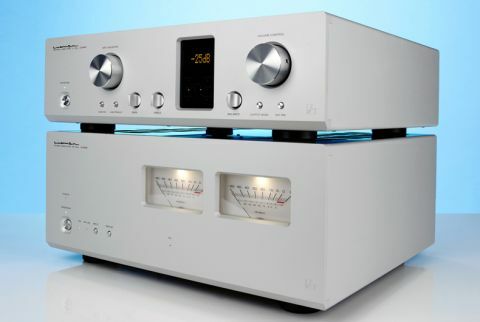 Since then it has become best known for producing classy, but understated, source and amplification components. The brand has never made a massive splash in the UK, but now under the watchful eye of the IAG Group (alongside Quad, Audiolab, Wharfedale and Mission among others) it is trying again. The C-700u/M-700u pre/power combination is a fine example of the company’s wares. These are neat, low-key products that never shout out for attention – visually or sonically – but given time, their considerable charms are likely to win you over. Once we wrestle them out of their packaging, the build quality grabs our attention. That’s not just because the pair weigh in at over 40kg, more that they feel immensely solid and engineered to last decades. These products are pleasingly tactile. We love the crisp action of the C-700u preamp’s input selector; the precise way it clanks into place is a joy. The volume control works beautifully too. It has a smooth, well-damped motion and whoever wrote the software that translates this movement into the digital steps of the display did a great job. It all feels wholly natural and intuitive in use. There are many other examples of Luxman’s art, such as the lovely machining of the M-700u power amp’s ventilated top panel or the pre’s nicely shaped tone controls, but we’re sure you get the idea – there’s no shortage of attention to detail here. These may be small things taken individually, but put them together and these products can stand tall against any rival. We even like the way they look. The Luxman brand has never been about flashy aesthetics. Instead, it has a keep-it-simple approach to ergonomics that works well in everyday use. Everything falls to hand and nothing feels overly fussy. There is the odd indulgence though; here it takes the form of rather lovely power meters on the M-700u. We have a soft spot for such retro details, but they can be turned off if you don’t. There’s no shortage of connectivity. The C-700u preamp has five single-ended line level inputs alongside a pair of stereo balanced XLR alternatives. There’s no built-in phono stage or digital inputs, but that’s the norm at this level, as most owners will have dedicated boxes for these tasks. The preamp isn’t short of analogue outputs either; there are four sets, split evenly between single-ended and balanced options – ideal when a single stereo power amp will just not do. The Luxman pre has relatively subtle tone controls, which can be of some use with poorly balanced recordings. Purists may want to bypass the tone circuitry – worth doing for the extra clarity it brings – and they can at the press of a button on the front. There’s also a rarity in the form of a ‘loudness’ control. This adds emphasis to both frequency extremes. It can spice up the presentation at low volumes, but we leave it off most of the time. As is the case with most power amplifiers the M-700u is a simple affair. It mirrors the preamp in having single-ended and balanced XLR connectivity. Usefully, you can toggle between the two options at the press of a button. Look around the back and you’ll find a switch that converts it from a stereo unit to a monobloc – just in case you need more grunt and have a spare £6k for a second unit. There aren’t many systems where that will be necessary though, as used in stereo the M-700u delivers 120W per channel into an 8ohm load. This increases strongly to 210W per side as impedance halves. Difficult-to-drive speakers shouldn’t be a problem with such reserves. Use it in mono form and the output is a stonking 420W into 8 ohms – quite enough for most circumstances. Neither of these units is small, so you’ll need a substantial support. Make sure that rack is rigid and low resonance. These are sensitive electronics that will reward such care with improvements in sound quality. The power amp gives off a far bit of heat when pushed hard, so it’s a good idea to position it in a place with decent airflow. The preamp also gets a little warm, so a bit of ventilation here would help too. As a general rule it’s good for reliability if components don’t get unnecessarily hot. Amplification of this standard requires a top class system to shine. It can only ever be as good as the source allows. We used our trusty Naim NDS/555PS streamer supplemented by Clearaudio’s Innovation Wood record playing package. The C-700u doesn’t have a built-in phono stage so Cyrus’s rather good Phono Signature/PSX-R2 filled in superbly. Our long-serving ATC SCM50 speakers completed the system. If ever there was a pre/power combination that shouldn’t be judged on the first listen this is it. Straight from the box the sound is thick, soft and lacking clarity. Leave it running overnight and things improve markedly. Once properly warmed, this pre/power combination delivers a tidy sound that matches the way they look. The edges of notes are precise, never overstated and delivered in a steady, controlled manner. Sounds boring? Not a bit of it, as we discover when we play Macklemore and Lewis’s Thrift Shop. There’s so much energy in this track and the Luxmans communicate it well. Their presentation is fast, agile and rendered with precision. Notes stop and start crisply, but never in a stilted way. There’s a lovely organic flow to the sound that puts us in mind of the best valve-powered gear, but here without a hint of excess warmth or richness. Rhythmically things are pretty good too. While no dance machine, this pairing keeps a firm hold of the rhythmic elements of the track delivering that distinctive bassline with punch and authority. It’s always hard to combine low-end heft with proper articulation but this combination manages it. This two-box is refined too, refusing to allow the recording’s slightly hard edge to become an annoyance. It’s a fine balance that retains plenty of bite but always stops short of harshness. Macklemore’s characterful vocal is clear and easy to follow. But here we notice a slight lack of expression, the Luxman’s glossing over some of the dynamic nuances and subtle shifts in pace that go into making his delivery so distinctive. We like the tonal balance. It’s even and convincing, something brought home when we listen to Kind Of Blue by Miles Davis. This recording may be almost 60 years old but we’re always impressed by the quality of the production from the immaculately captured instrumental textures to the impressive interplay between musicians. These Luxmans convey the varying tension of the music well, keeping us interested from start to the final notes. Switching to Stravinsky’s The Rite Of Spring shows off this combo’s impressive sense of scale and authority. The pair images well, creating an expansive, nicely layered soundstage that’s populated with crisply focused instruments. It’s capable of huge dynamics too, and can deliver the piece’s savage crescendos with enthusiasm. That generous power output makes itself felt at higher volumes where they can just pile on the volume while keeping their composure. So, not flawless but we’re pretty impressed, we’re also curious to find out how the pre and the power sound with different partners. We draft in our reference Gamut D3i/D200i pre/power for comparison. It turns out that the C-700u is the weaker of the pairing. Listen to the Gamut preamp with the Luxman power and there’s more dynamic expression, particularly with low-level shifts. This makes vocals sound more emotional. Timing improves too, as does the overall level of resolution. The Luxman preamp remains a composed and precise sounding unit, but by the highest standards of the price it lacks a bit of transparency. The M-700u power amp is something of a star, though. It doesn’t quite have the insight of the pricier Gamut D200i, but shows enough in the way of dynamics, timing and cohesion to really impress us. It’s got to be one of the best £6k power amps around. And let’s not forget, it has power meters. Despite our criticisms of the preamp, this Luxman pairing is tempting. We love the way they look and build is absolutely top class. More than that they (for the most part) just get out of the way of the music, and that’s a quality that’s far less common than it should be.